The wine, called marawi and released last month by Recanati Winery, is the first commercially produced by Israel’s growing modern industry from indigenous grapes. It grew out of a groundbreaking project at Ariel University in the occupied West Bank that aims to use DNA testing to identify — and recreate — ancient wines drunk by the likes of King David and Jesus Christ. Eliyashiv Drori, the Ariel oenologist who heads the research, traces marawi (also called hamdani) and jandali grapes to A.D. 220 based on a reference in the Babylonian Talmud. The redevelopment of local varietals, however — like so many things in this contested land — is not free of political friction. It comes alongside contentious new labeling guidelines by the European Union requiring that wines from the West Bank and the Golan Heights carry a label saying they were made in Israeli settlements. And Palestinians have their own ownership claims on these grapes. Yes, but the Palestinian farms that sold the grapes to Recanati have insisted on anonymity, for fear of backlash over working with Israelis, or just helping make wine, which is generally forbidden in Islam. Recanati, for its part, embraced the heritage, using Arabic on marawi’s label and hiring an Arab-Israeli singer to perform at its October unveiling to 50 select sommeliers. Wine presses have been uncovered in Israel — and the West Bank — that date to biblical times. But winemaking was outlawed after Muslims conquered the holy land in the seventh century. When Baron Edmond de Rothschild, an early Zionist and scion of a famed Bordeaux winery, helped restart the local craft in the 1880s, he brought fruit from France. Today, Israel’s 350 wineries produce 65 million bottles a year. The sticky-sweet Manischewitz was long ago overshadowed by top-quality chardonnay, cabernet, merlot, syrah, carignan and more. But there is only so far to go with such imports. 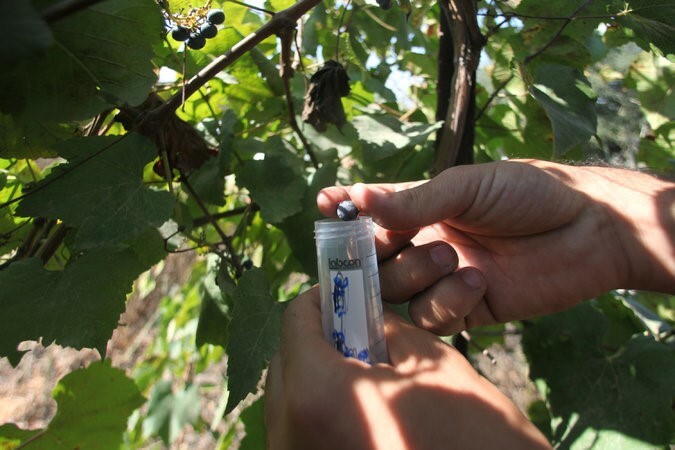 “Have we managed to create a DNA for Israeli wines? Not yet,” lamented Haim Gan, owner of Grape Man, a company that advocates Israel’s wine culture. Enter Mr. Drori, who has a Ph.D. in agriculture and in 2005, started a boutique winery, Gvaot, near his home in a West Bank settlement. There he noticed a neglected vine with small, very sweet white grapes that he thought might yield tasty wine. Separately, researchers have identified 70 distinct varieties, using DNA and a three-dimensional scanner that has never before been successfully employed this way, from burned and dried seeds found in archaeological digs. The idea is to match such ancient seeds with the live grapes, or someday perhaps to engineer fruit “Jurassic Park” style. He believes seeds found in donkey droppings in Timna — where copper mines date to King Solomon’s era, the 10th century B.C. — must have come from pomace, the residue left after winemaking, since animals would not have been fed fresh fruit. He also cites a Talmudic reference to a sage who lived in A.D. 220 that mentioned “gordali or hardali wine.” That was picked up by a 16th-century scholar who used slightly different names, jindali and hamdani, and described jindali as “soft to chew and the wine weak,” hamdani as “hard to chew and their wine strong” — characteristics similar to those of their descendants today. Given the difficulty of procuring the grapes from Palestinian farmers, Recanati produced just 2,480 bottles of the 2014 marawi, which is available in only about 10 Tel Aviv restaurants. The winery has about 4,000 bottles of 2015 marawi aging and hopes to soon plant its own vineyard to expand and refine the brand. Next up is dabouki, also white, which the well-known Israeli vintner Avi Feldstein plans to debut along with his new winery in a couple of months. Dabouki might be the oldest of the local varieties, a good candidate for what filled the glass of Jesus (who Mr. Drori believes drank white as well as red). Back at Ariel University’s research winery, small cooled trailers with eight wood-aging barrels, Mr. Drori and a graduate student, Yaakov Henig, have made tiny batches from about 30 different grapes in search of the great new — or perhaps ancient — Israeli wine. Their bottles are labeled with masking tape and handwriting recording the date and location of the harvest. There is a rich red from the shores of the Sea of Galilee, and a white from Sorek in the foothills of Jerusalem. A few specimens were so scarce they yielded only a small juice bottle. Mr. Henig has named his favorite, found in Nitzanim kibbutz near the Gaza Strip, “Yael,” after his 2-year-old daughter.